Sustainability has been the buzzword in Not-for-Profit Organisations (NPOs) in recent years as the quantum of funding for development purposes is rapidly declining. Sustainability can be categorised into Financial, Organisational and Programmatic Sustainability. Financial sustainability refers to the ability of the organisation to ensure a steady flow of funds for maintaining and continuing its work. Organisational sustainability entails ensuring the continued proper working of the organisation and any institutions that may have been developed as part of the organisation. The ability of the organisation to continues its projects or programmes beyond donor support is encapsulated in Programmatic Sustainability. These facets of sustainability have to coexist for effectiveness. Jeanne , Masaoka, & Zimmerman (2010) state that “For non-profits, financial sustainability and programmatic sustainability cannot be separated. It’s not enough to have a high-impact programme if there’s no effective strategy for sustaining the organisation financially. And neither is it enough to be financially stable: we build our organisations for impact, not for financial stability.” Additionally, in order to have continued implementation of programmes, there is need for an orderly and well instituted organisation responsible for ensuring implementation. 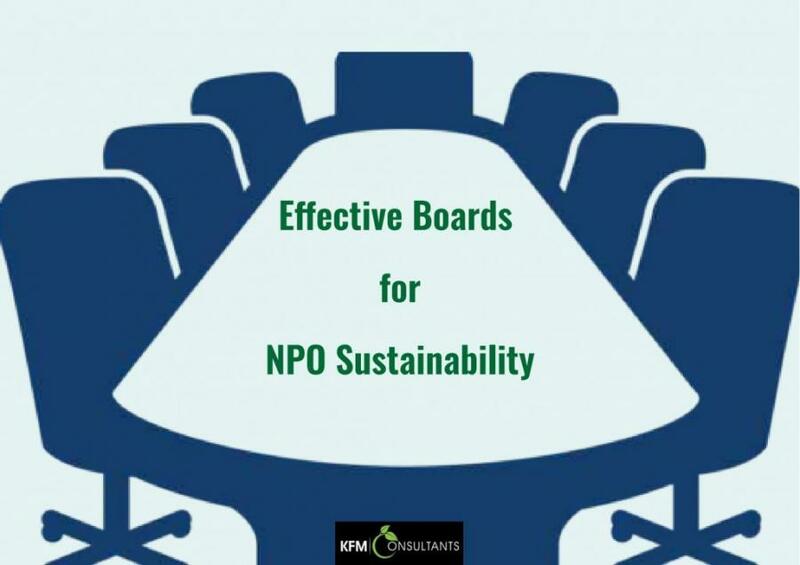 Boards have a critical role to play in ensuring sustained NPO operation. It is essential for organisations to be legally instituted to work within the jurisdictions they operate. In Zimbabwe, although organisations can operate as Charitable Trusts, Universitas or Private Voluntary Organisations (PVOs), there are various taxation, reputation and cost benefits associated with registering as PVOs (see this link for details). PVOs are subject to periodic monitoring by the Department of Social Welfare under the Ministry of Labour and Social Welfare and this places a burden on them to perform in ways that are impactful to the communities and hence are more likely to be sustainable. It is the responsibility of the Board of Directors to ensure that their organisations are well legally instituted and in compliance with the relevant laws and regulations. Organisations that are legally instituted are less likely to face legal dissolution by the authorities, hence can be sustained for longer. According to the Department of Social Welfare, there were 1,430 organisations legally registered as PVOs and only 10% of these organisations were up-to-date on compliance with local regulations. Evidently, the majority of NPOs in Zimbabwe need to either register as PVOs or ensure compliance with set regulations. Organisational sustainability can also be threatened by failure to comply with taxation requirements of NPOs, some of which are summarised in an article on our website. Whilst funds received by NPOs for charitable and other developmental purposes are exempt from tax, NPOs are obliged to comply with employee tax remittances under the Zimra Final Deduction System (FDS). The Board is ultimately responsible for ensuring that the organisation is compliant on its taxes and will not face collapse as a result of non-compliance. The Board of Directors should also ensure compliance of the organisations’ with funders’ reporting deadlines and community impact as non-compliance will eventually lead to failure to mobilise resources. Brand image is very critical to the continued reputation of the organisation. The Board should intentionally support initiatives to keep the organisation visible to the public. Providers of funding, governments, communities and other stakeholders will be encouraged to continue engaging with organisations whose impacts and activities are clearly visible for all. Brand visibility initiatives include the issuance of regular positive messages about the organisation’s work through various platforms such as newsprint, online advertising and arguably most importantly social media. One of the major roles of the Board of Directors is to set the long-term programmatic direction of the organisation. It is essential for the Board to be endowed with skills that can forecast the outlook of the environment that the organisation is operating in and determine the relevant focus areas that will be of most impact to the communities. This will ensure that the programmes chosen will benefit the society and in turn continue attracting support from external funders, governments and other key stakeholders. After all, NPOs are built on the relevance of the programmes to the society. Organisations are built and maintained by competent human resource base. In order to remain relevant in a dynamic world, there is need for continued capacity building to strengthen the skills base. The Board should be able to identify capacity building areas relevant for future programming needs to ensure that they develop the required skills ahead of other organisations in this world of competition for the reduced funding pie. The most legally compliant organisations promising to undertake programmes that might bring considerable impact to communities will not be able to see the light of day in the absence of funding for their activities. The Board is responsible for setting up strategic and financial sustainability plans with diverse income sources. Many NPOs have folded as a result of over-reliance on a single or just a few streams of income caused by Board myopia – the inability to forecast the need for diversification of income sources. Instead of depending on donor funding, the strategic plans should detail how the organisation will mobilise other non-restricted sources such as fundraising, membership, private sector collaborations etc. Financial oversight is also an important aspect of Financial sustainability. The Board should ensure that the available funds are utilised prudently according to the three pillars of Value for Money – Efficiency, Effectiveness and Economy. This will ensure that the available funds are utilised for maximised impact using the minimal resources. The Board should also work towards stable infrastructure and ownership of assets. They should ensure that there is adequate space and facilities with long-term investments such as endowment funds or a steady flow of membership fees to keep the organisation glued together. It is also essential to form alliances; build strong relationships with local business and government, encourage collaborations and share lessons learned with other organisations and work with many to make a difference in communities or in the country. Effective Boards will ensure that organisations continue to operate for effective transformation of societies. At KFM Consultants, we contribute to this transformation through providing financial management, governance and sustainability services as detailed below.. On the 28th and 29th of March 2019, we will be hosting an NGO Sustainability Conference in order to assist organisations to survive during times of austerity. Jeanne , B., Masaoka, J., & Zimmerman, S. (2010). Nonprofit sustainability making strategic decisions for financial viability. San Francisco Jossey-Bass.